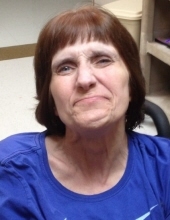 Kristen Ann Cole, 58, of Joplin, Missouri, passed away early Monday morning, December 31, 2018, at Joplin Health and Rehab after years of debilitating health. Kristen was born September 8, 1960, in Jefferson City, Missouri, to the union of the late Nathanial and Ruth (Wiser) Cole. She graduated high school and following graduation, she spent a summer working at Yosemite National Park in California. Kristen enjoyed reminiscing on her summer spent at Yosemite and she had a great love for the outdoors. She also enjoyed working crossword puzzles, remembering her cat, Ebony, and getting her hair done by her wonderful caregiver, Jackie. Kristen was preceded in death by her parents and an uncle. Survivors include her uncle, Dale Wiser; aunt, Bonnie Buckner; cousins, Paul Wiser, Debbie Edelstein and Jeff Wiser; and her loving caregiver, Jackie Chavez. Graveside funeral services for Kristen are 10:00 a.m. Friday, January 4, 2019, at Ozark Memorial Park Cemetery in Joplin. Arrangements are under the personal care and direction of Thornhill-Dillon Mortuary, Joplin, Missouri.